The prime objectives of IT-based organizational information systems (IS) are to improve efficiency and effectiveness of business operations (Santhanam and Hartono 2003; Thong 1999), and to gain sustained competitive advantage (Reich and Benbasat 1990). Despite information technology (IT) innovations which have resulted in lowering information systems (IS) costs and increased portability and integration, the IT industry is more susceptible to failures as compared to other industries (Whitney and Daniels 2013). These failures are attributed to ‘correspondence failure’ pertaining to system design objectives and specifications, and ‘process failure’ concerning allocated budget and schedule. Other factors include ‘interaction failure’ comprising user attitude, satisfaction, frequency and level of system usage, and ‘stakeholder expectation failure’ (Lyytinen and Hirschheim 1988). It is worth noting that all the above-mentioned failure categories include socio-technical aspect of IS/IT implementation and adoption, except process failure, which is primarily technical in nature. To explain and predict technology adoption behavior, there has been active theoretical and empirical research during the last two and a half decades. User acceptance models like Technology Acceptance Models (TAM, TAM2, UTAUT, TAM3) (Davis 1989; Venkatesh and Bala 2008; Venkatesh and Davis 2000; Venkatesh et al. 2003), Theory of Reasoned Action (TRA) (Ajzen and Fishbein 1980), the Theory of Planned Behavior (TPB) (Ajzen 1991), and Innovation Diffusion Theory (IDT) (Rogers 1983, 1995) have significantly contributed to the understanding of user acceptance of IS/IT innovations (Gangwar et al. 2014; Lai 2017). These studies, except IDT (Rogers 1983, 1995), typically explain factors that influence adoption behavior of individuals and not the organization as a whole (Jeyaraj et al. 2006), while information systems are adopted by organizations, not by individuals alone. IS/IT researchers acknowledge that all the above-mentioned models which helped organizations in the past to understand IS/IT adoption may not be suitable for today’s complex organizational environment (Córdoba 2009; Jokonya et al. 2012). In an IS/IT context, an organization is a system that includes software, hardware, and several stakeholders with different objectives, roles, and interests (Bentley et al. 2000). This broader perspective of IS/IT adoption is vital in explaining ‘complex’ and ‘emergent’ adoption behavior due to the shared use of IS and inter-stakeholder interactions. Moreover, adoption behavior is also dependent on factors of varying nature with psychological, social, ethical, regulatory and/or technical orientations. Thus, IS are social systems that are technically implemented (Aakhus et al. 2014; Goldkuhl and Lyytinen 1982). Hirschheim and Smithson (1998) also argued for a socio-technical evaluation of IS, as a purely technical aspect leads to meaningless inferences by hindering insights to the social activity embedded in the organization. As traditional IS/IT adoption theories do not provide insights to the roles of multiple stakeholders, their interactions, as well as other associated factors related to the adoption process, a broader view of IS/IT adoption is needed which encompasses inter-connectedness and other factors related to organizational stakeholders (Stockdale and Standing 2005). More recently, Zabadi (2016) while proposing an integrated model for adoption and use of IS in the Jordanian telecom sector, recommended the exploration of the interrelationships between technology, organization, and stakeholders for a deeper understanding of the adoption process. This review identifies a gap in IS/IT adoption literature that can be addressed with an approach that explores this phenomenon from organizational and social perspectives as opposed to a purely technical or individualistic viewpoint. To address this need, Hirschheim and Klein (1994), for instance, suggested to incorporate ‘Emancipatory Discourse’ in information systems development (ISD) methodologies to provide equal opportunities to all participants (experts and end-users) to express their concerns and raise questions. Similarly, Avital et al. (2009) emphasized that positive human values and a participative process should be encouraged in designing better socio-technical systems. Notably, linear or reductionist approaches which are more suited for mechanistic systems are unable to realize the complexities and emergent properties of human systems such as organizations. Consequently, an alternative holistic approach is needed to capture their real behavior. A recent example is Sun et al. (2015), who studied innovation adoption behavior from a systems thinking perspective in the Australian beef industry, arguing for a paradigm shift from linear thinking to holistic or systems thinking. Considering an organization as a socio-technical system, our research seeks to address IS/IT adoption from a Systems Thinking (ST) perspective–an approach that studies a complex system with its parts and their interactions for its emergent behavior (Waldman 2007). More specifically, a conceptual framework (Fig. 1) was developed which incorporated the boundary critique mechanism of Critical Systems Heuristics (CSH) to identify the boundary of analysis comprising stakeholders and their roles in this context. CSH, having its roots in Critical Systems Thinking (CST), argues for values (e.g. purpose, benefits, ethics) and an interests-laden critique for boundary identification considering multiple viewpoints (Ulrich 2003). This interests-laden critique refers to the judgment of a problem scenario based on the conflicting or contrasting viewpoints of multiple stakeholders (a coercive context) underpinned by their interests (Jackson 1991b; Jackson and Keys 1984). Since stakeholders play a central role in our research, to develop the conceptual framework within the context of our study, the definition of a stakeholder from a management perspective is applied i.e. “any group or individual who can ‘affect’ or is ‘affected’ by the achievement of the organization’s objectives1” Freeman (1984, p. 46). To demonstrate a practical application of this framework, a CSH-driven interpretive study is also presented to analyze the adoption of a web portal of an Australian university (henceforth referred to as Aus-Uni). Furthermore, these multiple stakeholder perspectives were used to identify and analyze barriers in IS/IT adoption termed as ‘systemic problems’. Before proceeding further, it is important to define systemic problems which play a central role in the findings of this research. ‘Systemic’ means affecting the entire or a major portion of a system. In the systems thinking paradigm, systemic means synthesizing the world or a problem scenario with all its complexity (Houghton 2009). A ‘systemic problem’ is a problem which hinders overall operations of an organization and produce unintended outcomes (Waldman 2007), and may thus be alleviated by changing the structure and organizational practices or policies in the system. Hence, a systemic problem is not defined in traditional ways in terms of individual or as an isolated factor such as communication gap, lack of resources, user error, or deviation from the norms (Gharajedaghi 2011), as considering them in isolation results in a handicap in understanding the entire problem scenario. A holistic or systems thinking perspective is therefore needed to unveil the roots of such problems with their cross-organizational synergies. Our study identifies three systemic problem scenarios viz. 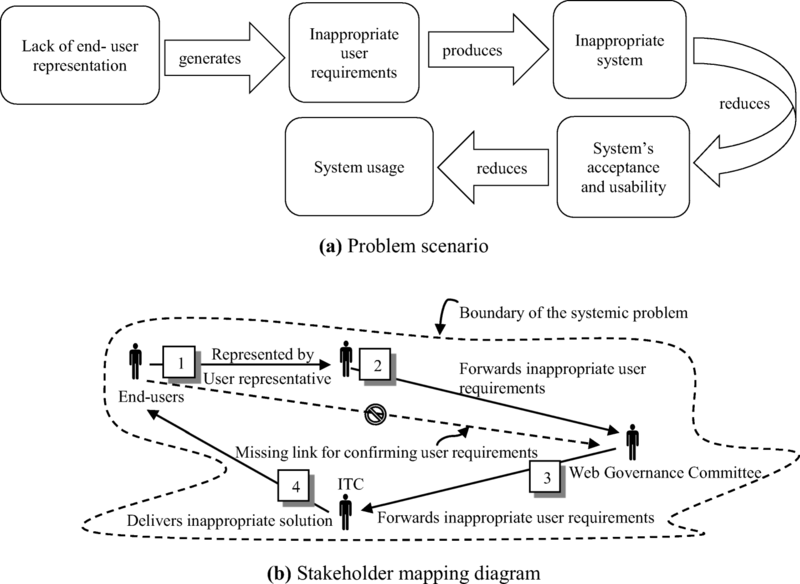 the mismatch between stakeholder perceptions and system usability; misinterpretation of end-user requirements; and the effects of information dissemination flaws within the stakeholder network. In addition to identifying the problem scenarios, which are underpinned by values and interests of the related stakeholders, a stakeholder mapping diagram is also constructed. Each diagram comprises the boundary of the problem with a network of related stakeholders showing their mutual interactions and involvement within the context of the problem scenario. Finally, the research findings are evaluated using a hermeneutic approach proposed by Klein and Myers (1999) for interpretive research in IS. Hermeneutics, derived from the Greek word ‘Hermeneuein’, is the art of interpretation or meaning-making which in most cases is hard to quantify (Klein and Myers 1999; Ward and Daniel 2006), This approach advocates for holistic research which encourages human participation and its analysis through an in-depth inquiry, focusing on participant’s viewpoints, emotions and attitudes rather than just as an observed behavior (Babaheidari 2007; Packer and Addison 1989). The coming section explains research approach and objectives, followed by a brief analysis of the literature, covering key concepts of ST, CSH and the related IS/IT research. Three phases of the study including development of the conceptual framework, data collection and analyses are then presented. Finally, a discussion based on the hermeneutic approach for evaluating our research is provided, followed by limitations and recommendations, and conclusion. This section is primarily organized as per conceptual framework presented in Fig. 1. It discusses the literature related to the two major streams of concepts that underpin this study i.e. Systems Thinking (ST) (boundary critique in specific), and Stakeholder Theory from a management perspective. Firstly, a brief discussion on ST is provided. This is followed by a discussion on CST, CSH, boundary critique, and their underpinnings in IS projects in a socio-technical organizational context. Systems thinking, also termed as systemic or holistic thinking, conceptualizes a phenomenon in its entirety before that of its parts (Ackoff 1995; Arnold and Wade 2015), as opposed to reductionism which considers system elements in isolation (Dongping 2007; Fuenmayor 1991). Systems theory argues that the mechanism of a system cannot be correctly portrayed by studying its components in isolation (Von Bertalanffy 1975), as it hinders the study of interactions amongst various parts and their effects on the behavior of the system of interest (Flood 2010; Jackson 2006). 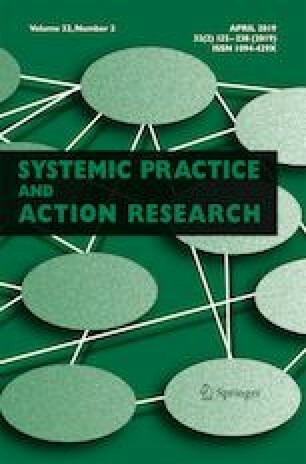 Systemic research approaches are applicable to social, organizational and technological systems (Black and Lebow 2009; Kalnins and Jarohnovich 2015; O’Donovan 2011; Sankaran et al. 2009; Vemuri and Bellinger 2017), and also to IS/IT contexts (Bentley et al. 2013; Córdoba 2007, 2009; Córdoba and Midgley 2008; Raza and Standing 2010; Warren and Adman 1999). Providing a comprehensive literature review on systems thinking is not the subject of this paper. Hence, the authors refer the reader to Midgley (2006) and Ellis (1995) for a detailed overview about the evolution of systems theory and its various strands. Critical Systems Thinking (CST) arose as a consequence of the critiques posed both on ‘hard’ and ‘soft’ systems thinking (Jackson and Keys 1984). ‘Hard’ systems thinking is particularly suitable for dealing with well-defined technical scenarios, and is considered as inadequate for dealing effectively with complex situations characterized by human activity (Jackson 1991a). ‘Soft’ systems thinking, also called soft systems methodology (SSM), considers organizations as social systems and advocates for subjective meanings and interpretations to such systems (Checkland 1981; Checkland and Holwell 1997). SSM methodology has received criticism for not being able to provide guidance to practitioners in addressing the problem of coercion (Jackson 1991b), and its inability to combine multiple methods (Bentley et al. 2013). Contrastingly, CST considers human intervention and broader organizational aspects pertaining to complex social and technological issues (Ivanov 2011; Jackson 1997). Based on the CST principle of human intervention or emancipation, Ulrich (1983) developed CSH as a methodology to interrogate and debate about planning and design of systems (e.g. social, organizational, technological) (Schwaninger 2006; Ulrich 2003). For such a debate, CSH proposed to systematically include not only those ‘involved’ in a system’s design, such as professionals and decision makers, but also those not involved but ‘affected’ by it (Ulrich 1987, 2000). CSH brought in the notion of boundary judgments through multiple stakeholder viewpoints for analyzing facts and values underlying such a decision making process (Carr and Oreszczyn 2003; Zhichang 2007). Boundary judgments are used to identify boundary of analysis by capturing key dimensions (‘who’ and ‘what’) of any purposeful system (Reynolds 2007). Boundary of analysis thus defines which stakeholders (who) to be involved, and what issues or sources of knowledge to be considered including role-specific concerns (designated responsibilities, values, and interests), and the key problems (Midgley 2003). A systematic mechanism for seeking relevant boundary judgments is therefore important to any systems thinking based research as two different boundaries of analysis will result in completely different outcomes for a context under study (Flood and Carson 1993; Jackson 2003). For boundary of analysis (who and what), boundary critique and stakeholder theory serve as the two foundation blocks in our research, as shown in Fig. 1. This section presents a brief overview of these concepts and their relevance to our context. A ‘perspective’ dimension recognizes stakeholder diversity and the influence of varied values, interests, beliefs, and past experiences of stakeholders on the viability of solution to a problem situation (Grohs et al. 2018). Boundary critique is the methodological core principle of CSH (Ulrich 1983), which provides a systematic mechanism and guidelines for defining boundary of analysis through boundary judgments of multiple stakeholder perspectives (Ulrich 1996, 2001). These judgments help in identifying relevant sources of knowledge such as values, interests and beliefs for the ‘context of study’ (what), and those ‘involved’ in and ‘affected’ by it (who) (Achterkamp and Vos 2007; Mulej 2007). The ‘context of study’ evaluates a tool or system against its purposefulness; ‘involved’ are the stakeholders who can influence the resolution of the context through decision making and/or the control of resources; whereas, the ‘affected’ are influenced by the actions of the ‘involved’ without having any authority in the decision making process (Ulrich 1983). These components of the boundary of analysis emerging through boundary critique are depicted in Fig. 2. As the views of stakeholders play a defining role in boundary critique, it was important who to consider as a stakeholder in our research. No common consensus currently exists as to what the concept of a stakeholder means, and the literature documents hundreds of different definitions (Miles 2012). In Mitchell et al. (1997), 38 definitions were reported, followed by Friedman and Miles (2006), who identified 55 published definitions. Later, Laplume et al. (2008) reported 179 definitions of stakeholders, while more recently, Miles (2011) reported 435 different definitions. Freeman et al. (2010) stressed upon the need of further work to bring refinement in our understanding about stakeholders. The authors thus resorted to the definition of stakeholder by Freeman (1984, p. 46) i.e. “any group or individual who can affect or is affected by the achievement of the organization’s objectives”. This definition complies to the stakeholder roles as specified by CSH, while in the context of organizational IS adoption and use, Aus-Uni web portal is the system under investigation for its purposefulness through the viewpoints of stakeholders who are ‘involved’ in and ‘affected’ by it. The leading work of Mumford and Weir (1979) related to the ‘socio-technical’ school of thought, paved the way for emancipatory methodologies in information system development (ISD). The socio-technical approach was useful to voice the concerns of the disadvantaged in a problem situation, and to enable them to take responsibility for the process themselves. Evolving philosophies and methodologies were later attempted to be incorporated in the IS domain such as Critical Social Theory of Jürgen Habermas to support broader social perspectives in IS research (Huynh and Klein 2004; Lyytinen and Klein 1985; Ngwenyama 1991). Due to the consideration of human intervention and broader organizational aspects pertaining to complex social and technological issues, CST has the potential to enable ISD approaches to be more critically applied (Córdoba and Midgley 2008). IS literature documents some studies based on Critical Systems Thinking (CST), and some notable ones are now briefly presented. Warren and Adman (1999) demonstrated the application of CST to improve an IS support service at a university in the UK. They used Total Systems Intervention (TSI) to operationalize CST and guide the course of interventions. They mainly used two different methodologies viz. ETHICS and QUICK ethics-the former allows for participation, while the latter is useful for determining information requirements for ISD. In a project with Javeriana University in Columbia, Córdoba and Midgley (2008) used boundary critique to investigate IS planning beyond organizational boundaries to address marginalization in the inclusion of societal concerns. They initially reviewed SSM and Technological, Organizational, Personal Perspectives (TOP) approach, and argued that the scope of these approaches is focused on the improvement of what falls within the existing organizational boundaries. Boundary critique was later applied and argued for as a complementary approach to SSM and TOP approaches rather than their replacement. Recognizing the importance of the inclusion of people and their perspectives, Córdoba (2009) presented a CST-based framework to support IS planning in organizations. This framework encourages the consideration of stakeholder views before the planning methods are selected by a few. Continuous identification of stakeholder concerns is also emphasized. Taking a similar stance, Raza and Standing (2010) integrated traditional Systems Development Life Cycle (SDLC) with the continuous stakeholder identification process named as ‘pha-stak-ification’. They considered IS adoption as a multi-phase innovation project and argued for a continuous boundary refinement as the project passes through its various phases. More recently, Jokonya (2016) explored user perceptions on critical systems thinking approaches during IS/IT adoption using case study methodology. Data was gathered about participants’ opinions on the importance of systems approaches during IS/IT adoption in organizations. The study results indicated that CST approaches have the potential to improve IS/IT adoption success in organizations through addressing both technical and social issues. The results also showed that different stakeholder groups (e.g. based on demographics) have different perspectives on IS/IT adoption in organizations. Notwithstanding, this study provides an alternative focus with the application of CSH for organizational IS/IT adoption having only been studied before in the context of individual stakeholders–the reductionist approach. From a socio-technical perspective, this study contributes to IS literature by explaining how boundary critique provides a holistic approach in providing insights to IS adoption issues and the stakeholders involved and affected by them. Moreover, it adds to CSH theory as to how boundary judgments can be used to identify systemic problems (systems of issues), and analyzed with a hermeneutic approach for evaluating interpretive studies in IS research. The study comprised three major phases viz. I) Development of conceptual framework, II) Data collection and III) Data analysis, as shown in Fig. 3. The details of each phase are given below. As stated earlier, systems thinking allows studying the emergent behavior of a system and serves as a broader theoretical foundation for our work. As illustrated in Fig. 1, the two main strands of this framework are boundary critique (Ulrich 1983), and management stakeholder theory (Freeman 1984). More specifically, the study analyzes systemic problems and outlines the experiences related to barriers in IS/IT adoption and use by viewing them through the eyes of multiple stakeholders. The details of the theoretical underpinnings of the conceptual framework are provided in the literature review. Interpretive research considers IS/IT as socio-technical entities (Babaheidari 2007), and has become a well-established method of inquiry within the IS field (Butler 2016; Hirschheim and Smithson 1998; Symons 1991; Walsham 1993, 2006). A qualitative (interpretive) research was undertaken to understand organizational level IS/IT adoption and use of a web portal at Aus-Uni through boundary critique mechanism of CSH to identify the boundary of analysis. To operationalize boundary critique, the twelve questions proposed by (Ulrich 1983) were used. These questions have been summarized in Appendix A. Ulrich (1983) classified the 12 questions around four social roles, which are presented under two basic categories of: ‘involved’ (stakeholders with decision power, and who also set purpose and performance measures), and ‘affected’ (people receiving the output or consequence of the system). For each category and role, there are corresponding questions about who plays that role and what is/are the key concern(s) related to that role (Carr and Oreszczyn 2003). The questions cover the purpose, performance measures, and roles such as clients or beneficiaries, decision makers (having a decision-making role, and control over resources), experts/designers (having knowledge related to IS/IT implementation) and witnesses, who represent the ‘affected’. Consequently, the primary objective or purpose of the web portal at Aus-Uni was identified as “an information system that provides easy access to the university information and resources” (as informed by the Project Manager). The following sections describe the step-by-step process of CSH implementation through the guidelines proposed by Reynolds (2007). A web portal implementation project at Aus-Uni was chosen as our system of interest (SoI) because it involved a range of information needs and workflows, and the consequent adoption challenges faced by a diverse set of stakeholders comprising IS professionals and the end-users. As academic researchers, the SoI was evaluated as independent or neutral observers (Walsham 2006) through face-to-face interviews to seek multiple stakeholder perspectives. Provided that various planning levels exist in any project, it is important to identify the level at which the evaluation is carried out. The ‘goal planning level’ (Reynolds 2007) was focused, which concerns administrative or operational practice (as opposed to objective and ideal level planning which are related to management and policy practices respectively). The perception of improvement against the stated purpose of the system (i.e. the Aus-Uni web portal) was then explored through multiple viewpoints. Stakeholders were identified to understand the concerns related to specific CSH roles as shown in Table 1. This is worth noting that while classifying stakeholders within the specified roles, there may be a considerable overlap as one stakeholder may play various roles in the context of the SoI. The stakeholders for our SoI comprised people directly responsible for the implementation of the portal such as Project Manager, IT Coordinator, the Director of Information Technology Center (ITC), and the user group (end-users) comprising academic and non-academic staff, and students from various degree programs including PhD, masters, and bachelors. A start-up map was sketched out, as shown in Table 1, with CSH questions in the ‘ought/should be’ mode using a document developed by an external consultant company about the Aus-Uni website, which served as a starting point for that company in the development of Aus-Uni portal. iii. Student Services Center (SSC) etc. This step comprised the development of questionnaire, based on Ulrich’s (1983) twelve questions (Appendix A); and conducting 25 face-to-face semi-structured interviews for seeking multiple stakeholder perspectives and probing into systemic problem scenarios within the context of SoI. A small sample size is adequate to reveal a comprehensive insight in most of the case studies (Tan and Hunter 2002). The interviews were regarded as semi-structured as, in addition to the questions adapted from Ulrich (1983) (see Appendix B), further insights were gained through open-ended questions. The approval for interviews was secured from the Ethics Committee at Aus-Uni, and were conducted with participants’ consent, assuring the privacy and confidentiality of the interviewees. The evaluation of the findings have been carried out on the basis of the principles of hermeneutic approach proposed by (Klein and Myers 1999). It must be noted that Klein and Myers (1999) proposed these principles not as bureaucratic rules, but instead envisaged researchers to use their judgment about the applicability of each principle in the context of their research. The discussion section elaborates these principles in the context of our research. This section presents the insights gained from the interview data. Each interview lasted for 30 to 45 min and was audio-recorded, transcribed and analyzed using NVivo software. The interviews provided stakeholder perspectives which were used for boundary judgments to identify the boundary of analysis, and consequently the systemic problems. Typically, stakeholders in an IS/IT project include end-users (e.g. employees and their managers) and IS professionals, i.e. those responsible for the design and development or improvement of IS (e.g. system analysts, developers or programmers, and project managers). As managing user expectations has become a critical factor for the delivery of successful IS (Staples et al. 2002), IS professionals are required to reconcile the expectations of end- users and those of senior management (Elpez and Fink 2006, p. 222). The IS professionals thus serve as ‘suppliers’ of IS/IT, while the end-users can be considered as ‘customers’. In this research, the analysis of stakeholder viewpoints has thus been framed in terms of two major categories of ‘IS professionals’ and the ‘end-users’, referred to as C1 and C2 respectively. C1 comprised views of Project Manager (Deputy Vice Chancellor - DVC), the Director of Information Technology Center (ITC) (henceforth referred to as Director ITC), IT Coordinator as a representative of portal developers and ITC support staff. C2 comprised views of the end-users (academic and non-academic staff and students). The academic staff refers to the teaching personnel, while non-academic staff refers to people from various support areas of Aus-Uni such as Library, Human Resources Center (HRC), Office of Research and Innovation (RI), Marketing Department, and Graduate Research School (GRS). Based on the viewpoints of C1 and C2, the roles of these stakeholders, as specified by boundary critique (Table 1), were examined with ‘should be’ and ‘is’ perspectives. Tables 2 and 3 summarize the outcome of this process. Moreover, these viewpoints evolved as boundary judgments for ‘should be’ and ‘is’ perspectives revealing the common stakeholders (shared areas) for C1 and C2 respectively (Figs. 4 and 5). Based on the guidelines proposed by Raza and Standing (2011) for modeling organizational conflicts, these judgments were later used to explore and model systemic problem scenarios (Fig. 6). The most important aspects of C1 and C2 unveiled during viewpoints analysis are now summarized. Since the presentation of entire qualitative data is not possible, we only list some notable quotes related to these aspects. The C1 perspective for the three roles of ‘involved’ (i.e. beneficiary, decision maker and expert/designer) and role of the ‘affected’ is shown in Table 2. For each category of ‘involved’, some overlap was found in stakeholder viewpoints, except for the category of the ‘affected’ for which contrasting views were recorded (see Table 2 for the role of Guarantor/Witness). Consequently, Table 2 emerged as Fig. 4–a pictorial representation of the boundary of analysis for C1. The shared area depicts the common stakeholders that were identified by C1 for ‘should be’ and ‘is’ perspectives. As shown in Table 2, Project Manager and ITC were found to be the actual guarantors/witnesses for the ‘affected’ through ‘is’ perspective as opposed to the Web Governance Committee, while students and staff (academic and non-academic) were identified as ‘affected’ for both perspectives. Well, it [Web Governance Committee] doesn’t have student representation at present. But we, in the last meeting, decided that we get some students… probably through the [student] Guild. One of the other areas that should be involved are the support areas such as service desk, not in the decision-making process, but when we change things [on the portal]. We should be making sure that they are aware of what we have changed so those support areas can answer the questions from the end- users about the portal. It is not just the IT support, it is really all the support areas of the university. It all comes down to [whether] the [committee] members are accurately representing them [i.e. the end-users], do the business requirements reflect what the students and staff really want out of that thing [portal], or they [the decision makers] are actually representing what they want out of the portal. We should have the ability for blind people to be able to read [the portal] with the appropriate technology. That doesn’t mean totally blind, blind being with 20 or 30% vision something like that… blind with partial sight. I think we need to have more personas. So, when you log into the portal, it needs to be targeted more precisely at what type of student you are, what type of staff member you are. [What] we need to do is to be able and try to make the portal a little bit more contextual to different types of roles within the university and I think that’s what we are looking at the moment. C2 perspective for the three roles of involved and role of the ‘affected’ is shown in Table 3. The Project Manager, ITC, Marketing, Senior Executives (Chancellor, Vice Chancellor (VC), Deans and Vice Deans) were identified with the role of guarantor/witness for the affected (‘is’ perspective), while Web Governance Committee was the guarantor of the affected for the ‘should be’ perspective. On the other hand, the students, staff (academic and non-academic), researchers, government of Western Australia and the outside community were the ones affected through ‘is’ perspective. Students should be involved since it’s a large group… what they want portal to look like, what they want screens to be like while using it. I think we’d have a very different tool if we did that. In terms of staff, I have seen calls to be involved… I think students are affected but they are not involved. I don’t know whether they have been asked. Students should surely be involved. I think every school should have a user representative, so from each school you should have student, admin (non-academic staff) and academic [as a representative]. I am not a democrat that believes that every single person should be involved… it has to be done on the representative basis. But they [project management/Developers] have got to do it with the interests of those people very much in mind not just their own interests. The portal has been changing quite a lot so unless you are using it daily, [you] sometimes don’t notice all the improvements. So, some sort of regular communication to be improved to make people aware of changes. The following section presents the summary of comparison between the stakeholder viewpoints from C1 and C2 categories. Only notable findings are listed for brevity. Both C1 and C2 thought that students and staff should be the beneficiaries as well as decision makers, while Project Manager and Heads of the functional areas across Aus-Uni were the current decision makers from the perspective of C1. On the other hand, ITC, academic staff, Student Guild, Web Governance Committee, Marketing Department, Heads of Schools, SSC, Copyright Officer, Senior Executives (e.g. VC, DVC, Deans & Vice-Deans) were the decision makers from the perspective of C2. As the portal was designed to satisfy information requirements of both students and staff, from the C1 viewpoint there ‘should be’ a group in the Web Governance Committee with representation from each faculty along with ITC to satisfy the information requirements of both staff and students. According to C2, representatives from academic and administrative staff, HRC and finance ‘should be’ the experts for the staff portal, while library, SSC for the student portal. However, CIO, IT staff, Executive Deans, people from marketing, Vice Chancellor and the Project Manager were recognized as current experts from both C1 and C2 perspectives. As per C1 and C2, students and staff were found to be the ones affected. Their involvement/representation (i.e. witnessing) was found challenging as no mechanism was found that could seek student feedback as well as their role of involvement (i.e. as decision makers and/or experts) in the Web Governance Committee. The only mechanism for student feedback as identified by the Project Manager (C1), was through e-mails. Within C2, students, staff (academic and non-academic), and library personnel advocated for their close involvement in the project as being the mainstream stakeholders. The comparison between C1 and C2 perspectives also helped in gaining insight into the system requirements related to portal usage, especially for the end-users (staff and students), as shown in Table 4. The coming section provides details on these issues in the context of identifying a systemic problem. The perspectives of C1 and C2, as depicted in Figs. 4 and 5, identified common and contrasting viewpoints for ‘should be’ and ‘is’ perspectives in terms of stakeholder roles specified by Ulrich (1983). The common stakeholders were shown inside the shared areas, while the remaining were listed on the lateral sides of the shared areas. These two diagrams were eventually used to identify systemic problem scenarios as a ‘system of conflicts’, as explained below. Using CSH, Raza and Standing (2011) modeled organizational conflicts as a ‘system of conflicts’ by positioning it as a subsystem of the ‘system of stakeholders’. In their model, a ‘system of stakeholders’ emerges from the boundary judgments secured by practicing CSH, while the ‘system of conflict’ shows the interactions of stakeholders in conflict with one another on certain issues. The conflicts are thus woven together as a system, showing a holistic picture of the organization-wide involvement of stakeholders in this context. In our context, Figs. 4 and 5 served as the starting point to further explore inter-stakeholder interactions, which eventually emerged as a ‘system of conflicts’, as shown in Fig. 6. It portrays systemic problems as a ‘system of conflicts’ and provides an organizational view of various stakeholders in conflicting scenarios, which hindered overall functionality of the portal. A ‘system’ of conflicts’ thus comprises organizational-wide conflicts scenarios identifying the interactions of those stakeholders who are involved and affected by them. Starting from individual stakeholder perspectives, a higher level organizational perspective to look at systemic problems as organizational conflicts was achieved, which is a useful lens for a holistic organizational view to plan intervention strategies for conflict management and evaluation (Raza and Standing 2011). Since CSH considers stakeholders as a primary dimension, this is also worth noting that our approach not only explored systemic problems in terms of the contributing factors, but also modeled the stakeholder interactions as ‘stakeholder mapping diagram’ for each problem scenario. These insights revealed three such scenarios related to IS adoption and use; each of which is presented in the next section. 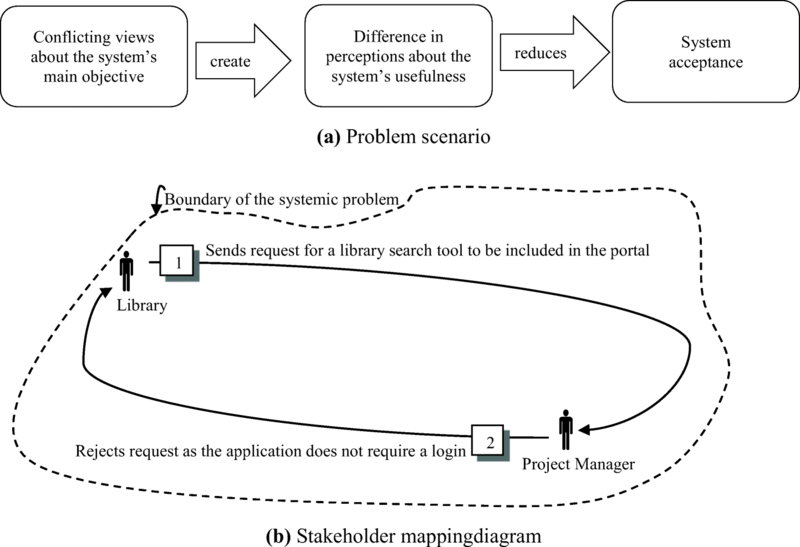 Each problem scenario is shown with two diagrams; one identifying the factors causing the problem; and the other as stakeholder mapping. 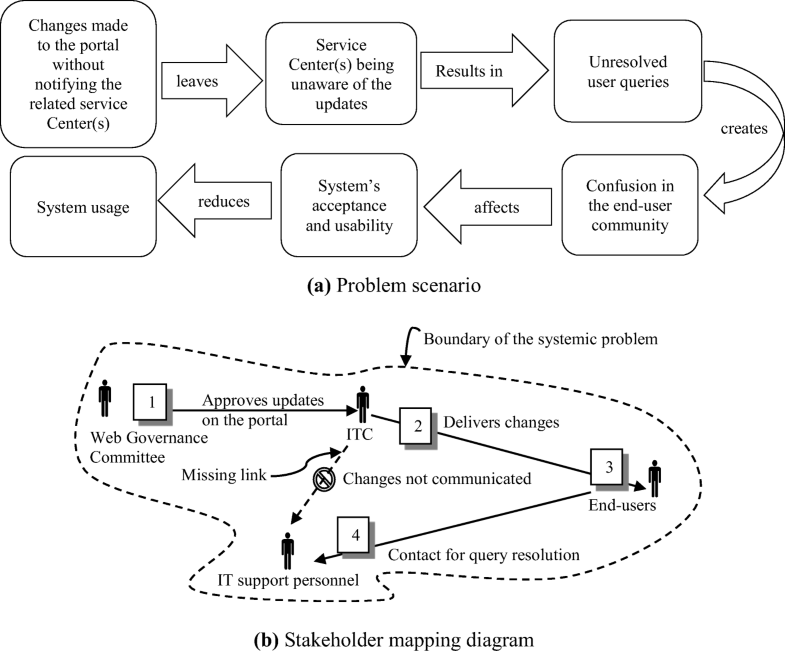 Conflicting views about the main objective or purpose of the Aus-Uni web portal created different perceptions about the usability of the system and consequently affected system’s acceptance. The perception of the Project Manager about the portal’s main objective was found in conflict with the library representative. The Project Manager described it as single sign on, which could enable users to access different resources of the university. According to the Project Manager, any system with no login requirement should not be the part of the portal. The viewpoint of the library representative was that any university resource whether it had a login requirement or not should be part of the portal. Thus, inclusion of a university resource into the portal should be based on what is useful and relevant to the end-users. Figure 7a, depicts the factors underpinning the problem scenario. These conflicting views surfaced when a request was sent from the library for the inclusion of a search tool called ‘Library One’ on the portal, which was declined by the Project Manager as it did not require a login (Fig. 7b). As per the library representative, the absence of this search tool would create problems for students in accessing library resources. On the other hand, Project Manager believed that the absence of login requirement by the search tool would create problems in maintaining the logic of single sign-in, which ultimately would affect the usability of the portal. Thus, in this scenario the ‘involved’ Project Manager ‘affected’ both library as well as students in terms of system usability. Usability is considered to be one of the key issues related to user acceptance of an information system (Nielsen 1993). While usability is generally related to the presence of an effective functionality of an information system (Sommerville 1996), a usable system may not continue to be useful due to a lack of ease in using the system’s interface (Bevan 1995; Grudin 1992). TAM’s core constructs ‘perceived usefulness’ and ‘perceived ease of use’ also determine the user intentions for system usage (Davis 1989). The view of library representative about the usability of Aus-Uni’s web portal falls into the same category of perceiving the system as usable but not useful for students. According to ISO 9241–11 cited in Ågerfalk and Eriksson (2006, p. 24), usability is the achievement of specific objectives with “effectiveness, efficiency and satisfaction in a specified context of use”. The library representative perceived that the absence of ‘Library One’ tool would result in the partial achievement of the portal’s objectives as the students would be forced to go to other university systems such Aus-Uni web site for using ‘Library One’ tool. This would require extra mental and physical effort resulting in partial satisfaction with the Aus-Uni portal, which would eventually destroy the purpose of the portal as a single platform to access all information. It should also be noted that the students were not aware of this conflict between the library representative and the Project Manager and were therefore unable to express their concerns about it. Fig. 7b, therefore, does not show them as a stakeholder directly involved in the conflict. You can’t obviously talk to 4000 staff members and 22000 students individually, so there should be a process of dealing with as many people as you can in certain sort of structure…structured format… through workshops or forums or whatever. The above-mentioned issues unveiled that the lack of end-user representation on the Web Governance Committee lead to the misrepresentation of the actual requirements of these ‘affected’ end-users–a systemic problem which eventually harmed system’s acceptance and usability by the end-users, as shown in Fig. 8a. It all comes down to [whether] the [committee] members are accurately representing them [i.e. the end-users]”. The end-users the students and staff, they should be involved. It is very hard, very challenging to involve so many people… how you do that, it’s very challenging. The above analysis resulted in the following stakeholder mapping diagram shown Fig. 8b. This systemic problem pertaining to misrepresentation is quite frequent in political negotiations (e.g. inside a parliament) leading to compartmentalization of issues as it ignores the ethical stance of raising the concerns of those being represented. In the context of the web portal project, a boundary comprising the Web Governance Committee excluding student representation would thus likely result in the marginalization of the end-user concerns. The solution is to ensure proper and direct representation of all end-users. This issue was already realized by the Committee members who were considering some student representation from the Student Guild. This would eventually eliminate the missing link, causing the misrepresentation issue shown in Fig. 8b. This problem scenario resulted due to the communication gap between the system developers (ITC) and the IT support services. IT support services (such as IT helpdesk, SSC), being unaware of the changes made to the portal were unable to comprehend and rectify user inquiries, which ultimately affected system’s usage, as shown in Fig. 9a. This communication gap, shown as the missing link in Fig. 9b, would affect these service centers as the portal undergoes further development or improvement. This communication gap was found to be the cause of trouble for the related service centers including the IT helpdesk, student support staff within student service center, library, and faculty support staff. Such communication gaps must be minimized to eliminate misunderstanding and potential problems. This section discusses and evaluates this research on the basis of the seven principles proposed by Klein and Myers (1999) for conducting and evaluating interpretive research in IS. The seven principles are: hermeneutic circle; contextualization; interaction between researchers(s) and subjects; abstraction and generalization; dialogical reasoning; multiple interpretations; and suspicion. This section describes how these principles underpin our research, if indeed a specific principle was practised. It also indicates as to how these principles are informed by the guidelines provided by Reynolds (2007) for practising Critical Systems Heuristics, as discussed earlier. The principles specific to this section have been numbered as i, ii, and so on. This fundamental principle provides the basis for the other six principles. Hermeneutics emerged as the study of textual data analysis (Lee 1994). As opposed to a scientific approach which sees interpretation and analysis as the two ends of a spectrum, the hermeneutic approach visualizes interpretation and analysis as being on the circumference of a circle, where the viewpoints formulate a ‘forward arc’ and their interpretations form a ‘reverse arc’ (Packer and Addison 1989), which establishes a constant learning process for context under study. The ever-changing stakeholder needs in an organizational and IS/IT context results in user needs (forward arc) and their perspectives on the designed solutions (reverse arc) to be in continuous motion. Thus, hermeneutic enquiry is a suitable approach for evaluating this research. This principle was based on guideline 1 (search for the ‘system’), guideline 2 (researcher’s role as evaluator) and guideline 3 (level of planning) as explained earlier. The project of web portal at Aus-Uni was undertaken to address the information needs of its various stakeholder groups through a common forum. The project was preceded by the implementation of the Aus-Uni website which initially allowed access to various systems which were subsequently accessed through the portal. However, some of them could still be accessed without using the portal. The internal document that elaborated on the implementation issues of the Aus-Uni website was consulted to understand the contextual history of the portal project. This document, which was prepared by an IT consulting company, provided a review of the standards followed in the implementation of the Aus-Uni website and the factors considered in addressing the information needs of the stakeholder community of Aus-Uni. Although the Aus-Uni website implementation and that of the portal were not sequential, as the portal project was initiated while the website implementation was still in progress, the internal document still provided the pros and cons of the website project. It provided insights into the environmental settings in which portal project was initiated. This study refers to the portal project as a ‘moving target’ (Klein and Myers 1999) as it was perceived as a change project. The project was triggered by emerging information needs and technological advancements for which getting continuous user feedback was deemed essential. Guideline 4 (identification of stakeholders) and guideline 6 (dialogical engagement), listed earlier, provided the basis for this principle. The mode of interaction with the subjects or participants, as mentioned earlier, was through semi-structured face-to-face interviews on an individual basis. The research recognized them as ‘interpreters’ of the context under investigation (Klein and Myers 1999). This aspect was further addressed by posing additional (open-ended) questions, which facilitated open conversations providing richer insights which may not have been gleaned solely through structured questions (see guideline 6). Such questions also served as a yardstick for verifying information, gathered from other participants, which assisted in exercising the principle of suspicion (see principle vii). Generalizations from interpretive case studies can be classified into four types; developing concepts, generating theory, extracting inference, and contributing to rich insight (Walsham 1995). The purpose of this research is the acquisition of a rich insight into ‘systemic problems’ confronted in IS portal implementation through multiple stakeholder viewpoints. The study does not generate a new theory or a definitive IS adoption model. Sufficient contextual information has been provided about this research to assist those making judgments about the transferability of these research findings to similar contexts. It is, however, incumbent upon them to check whether there is enough contextual similarity among the problem situations to achieve a valid transfer and generalization. This principle is underpinned by guideline 6 (dialogical engagement) which provides a set of twelve questions based on Ulrich (1983) to set up a ‘dialectical’ process. These twelve questions have been appended along with additional questions to enhance the depth of insights from the study. Qualitative inquires such as interpretive research cannot be purely objective (Packer and Addison 1989), and therefore, contextual bias remains a threat (Mason et al. 1997). The researchers do also have some ‘preconceptions’ (Klein and Myers 1999) which may cause both understand and misunderstand the context under study. The prior knowledge and prejudices of the researcher have been balanced by the collection of viewpoints of multiple stakeholders and cross-checking them across the spectrum of views, collected from various stakeholders around Aus-Uni. The principle of multiple interpretations is inherently embedded in the practice of boundary critique, which is the core methodological principle of Critical Systems Heuristics (CSH). Using this critique, multiple stakeholder viewpoints were sought to establish the boundary of analysis for stakeholder categories of C1 and C2 for ‘should be’ and ‘is’ perspectives (Figs. 4 and 5). These figures eventually emerged as the ‘system of stakeholders’ comprising a ‘system of conflicts’ with systemic problem scenarios, as shown in Fig. 6. The principle of suspicion is one of the least developed in IS literature (Klein and Myers 1999). Preconceptions could have led to bias, ultimately leading to misinterpretation of viewpoints. This was avoided through the cross-examination of the viewpoints gathered from the stakeholders of the same group, such as multiple stakeholders within C2 i.e. the end-users comprising academic and non-academic staff and students. Since every single viewpoint on every interview question was not possible, only relevant and unique viewpoints in the context of the research objectives are listed. This provided a mechanism to look at the situation through multiple eyes within the same group and detect any bias based merely on personal interests of certain stakeholders which may have led to inappropriate interpretation of the problem scenario. Systemic problems are considered fundamental barriers to IS/IT success. Our study looks at systemic problems as static entities, without considering their dynamics over time. Moreover, neither any intervention strategies for the resolution of these problems are proposed nor any mechanism to evaluate their outcome. Further research is needed to study the evolution of ‘system of conflicts’ over time which considers the changes in stakeholder involvement and their viewpoints in the context of systemic problems. Raza and Standing (2011) provide guidelines in this context by considering the ‘system of conflicts’ as dynamic entities. Due to everchanging user requirements and expectations along with rapid technological innovations, it is recommended that the identification of stakeholders using boundary critique should be a continuous process distributed over various phases of an IS project. A systemic model for IS adoption proposed by Raza and Standing (2010) discusses how boundary critique could be applied on a continuous basis throughout an IS project life cycle. The authors argue that exercising boundary critique throughout the project lifecycle will facilitate change dynamics, bringing about improvement in a complex organizational setup. A significant research gap in the understanding of IS/IT adoption from systems thinking perspective at the organizational level was identified. This led to hypothesizing a conceptual framework as the basis for the remainder of the study. 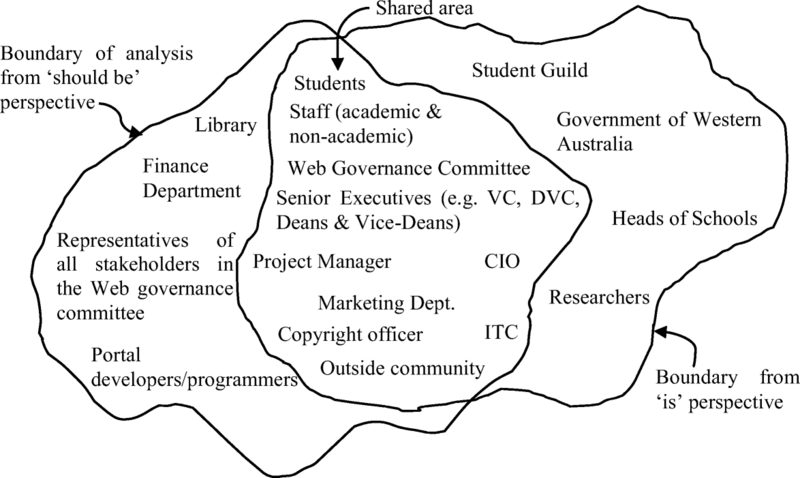 The original contributions of this paper lie in the application of Critical Systems Heuristics (CSH) and management stakeholder theory in a socio-technical context of a Western Australian University; and identification of organizational conflicts as a ‘system of conflicts’ modeled as a subset of a ‘system of stakeholders’. This study should be regarded as an exploratory project, the outcomes of which are situationally specific. Thus, the findings and conclusions emerging from this research cannot be generalized across the entire range of portal projects within academic or enterprise communities, as it only represents the views of those stakeholders who participated in the portal implementation project at Aus-Uni.